Detroit Metropolitan Wayne County Airport (DTW) recently completed the reconstruction of one of its primary arrivals runways, 4L-22R, and several associated taxiways. Major construction began in April 2016, and the runway reopened just seven months later in early November. With a notoriously vexing airfield configuration, Long Beach Airport (LGB) in southern California is leading the charge for an FAA initiative to reduce runway incursions throughout the United States. Before Coles County Memorial Airport (MTO) in Mattoon, IL, reconstructed its 41-year-old main runway, the project team looked far and wide for the best way to keep costs down and cause the least possible disruption of day-to-day operations. The preferred strategy? Rubblization, a process that breaks down existing concrete into small, uniform chunks, thereby making it an ideal base for subsequent layers of asphalt or concrete. When the main runway at Alaska's Yakutat Airport (YAK) experienced damage from harsh hydrogeological conditions, the state's Department of Transportation and Public Facilities tread carefully when crafting a solution. As owner and operator of the airport, the department knows that any project in the lowlands area around the Gulf of Alaska includes extra hurdles-specifically weather and logistics. There's no easy way-or good time-to shut down an airport for three weeks, especially a regional hub that serves as a major tourism gateway. But officials at Redmond Municipal Airport (RDM) pulled it off with nary a hitch during a recent $18.5 million runway reconstruction project. When you hear the phrase "bright lights, big city," Las Vegas may be one of the first places that comes to mind. Effective light management, however, is an exacting science that takes into account many variables such as lumens, energy usage, lamp longevity and even light pollution. All of the above and more came into play when Henderson Executive Airport (HND), located in the very shadow of Vegas' world-famous "strip", expanded its airfield ramp area and installed new lighting during a four-month, $4 million project last fall. Airfield maintenance can be tough at any location, but few places in North America present more challenges than northern Alaska. Keeping runway and taxiway lights working at the remote airfields that dot the state can be extremely challenging, and workers who undertake the job often work in downright punishing conditions. In early 2014, the city of Dallas and Dallas Love Field (DAL) were in a unique and ultimately timely position from operational and funding perspectives alike. The expiration of the Wright Amendment in October 2014 allowed air carriers to modify flight routes out of DAL, thereby increasing air traffic and changing the aircraft types needed to handle traffic. In addition, the upcoming 2017 expiration of the letter of intent associated with the long-running Love Field Modernization Program will make federal discretionary and entitlement dollars available for airfield-related projects that had been deferred because of the modernization program. In April, McCarran International Airport (LAS) in Las Vegas reopened its 14,500-foot primary runway, following a six-month closure. 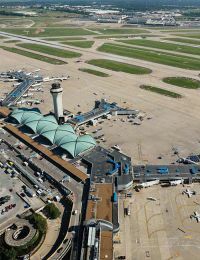 Runway 7L-25R, which handles about one-third of the airport's traffic, had been temporarily closed from October to April during each of the past two years to replace nearly 366,000 square yards of deteriorated asphalt concrete pavement. Now, aircraft operate on 19-inch-thick, full-strength Portland cement concrete pavement. Armed with magnifying glasses and kneepads, crews spent the fall of 2014 examining the pavement and paint on every airfield at every public airport in Virginia. In total, they surveyed 62 commercial and general aviation facilities. 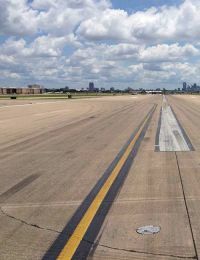 As a result, airport operators and state officials now have a concrete plan to improve the safety and longevity of their runways, taxiways and aprons. When officials at Baltimore/Washington International Thurgood Marshall Airport (BWI) began strategizing about how to comply with the recent runway safety area deadline, they did not expect to end up with a new airfield. One decade later, however, that's essentially what they have. Sometimes, the phrase "perfect storm" refers to a rare combination of events that leads to disaster. Other times, it describes similarly unusual circumstances that create an amazing outcome. 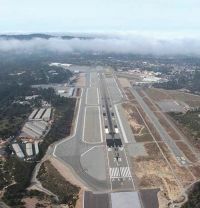 Surprisingly, a recent runway safety area project at Monterey Regional Airport (MRY) met both definitions at various points. 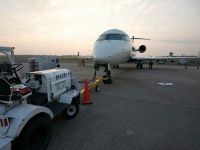 When officials at Meadows Field Airport (BFL) in Bakersfield, CA, started planning to replace the facility's aging main runway, they expected a price tag of around $10 million. But the initial tally approached $70 million, prompting a bad case of sticker shock. 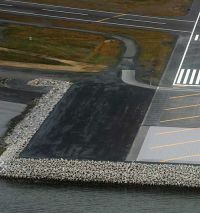 Research that may lead to more widespread use of “green” runway pavement materials is underway at the FAA National Airport Pavement & Materials Research Center, in Egg Harbor Township, NJ. Engineers at the new facility use a custom-designed heavy vehicle simulator to test asphalt and other pavement materials at high tire pressures and temperatures. Kodiak Benny Benson State Airport (ADQ) faced a quandary when devising plans to meet the federal mandate for runway safety areas: There simply wasn’t enough land at the island-bound Alaskan facility to add them. So planners got creative and built into the ocean. Contractors moved an estimated 1.1 million tons of rock to fill a portion of the Gulf of Alaska in order to create enough surface area for an engineered material arresting system (EMAS) on one runway and to lengthen another runway to allow for an EMAS bed on its other end. Denver International Airport (DEN) has a new tool at its disposal for managing winter operations: in-pavement sensors that help predict when ice will form on runway and other airfield surfaces. The system includes five clusters of sensors embedded in Runway 17L-35R, one of DEN’s four north/south runways, and three more clusters in adjacent high-speed taxiways. The in-pavement sensors were installed as part of a $46.5 million runway resurfacing project. Many airport operators feel they have limited options when it comes to airfield pavements. 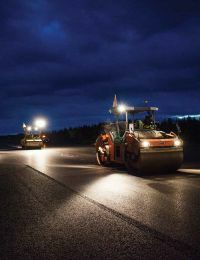 As vital concrete and asphalt assets age and deteriorate, they repair areas as needed and wait for the field's pavement condition index to dictate a replacement project. When that day comes and goes, a new version of the same cycle begins again. How does an airport with just one runway maintain operations while rehabilitating that runway? After nine months of intense and highly coordinated work on Runway 18-36, Myrtle Beach International (MYR) has some answers. Seattle-Tacoma International Airport (SEA) recently completed the total reconstruction of Runway 16C-34C, giving new life to the oldest of its three runways. And what a life it will be. The 9,426-foot runway that was originally built in 1969 is now projected to have another 40-year lifecycle. It's often a challenge to secure partial funding for major projects, but Gainesville Regional Airport (GNV) in Florida received full funding from the state for its recent $2.8 million runway renovation. Typically, the Florida Department of Transportation (FDOT) will pay up to 50% of construction expenses at state airports. However, it pays up to 100% of the cost for special demonstration projects. In addition to the standard noise abatement challenges all airports face, Denver International (DEN) has an additional layer of complexity: a stringent noise compliance agreement with its county that dates back to 1989. Each of the agreement's 101 points includes a $500,000 annual penalty; so noise infractions could potentially cost DEN more than $50 million every year. 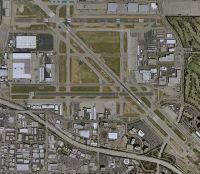 Los Angeles World Airports (LAWA) is nearly halfway through an ambitious three-year project to bring all four runways at Los Angeles International Airport (LAX) into compliance with FAA runway safety area requirements. 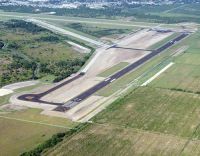 Justin Lobb, manager at Immokalee Regional (IMM) in Florida, doesn't mince words when he recalls how badly the airport's north-south runway needed a major makeover: "The pavements showed signs of water intrusion and longitudinal cracking. The maze of drainage ditches between the runway and Taxiway B also presented maintenance challenges. Irregular grading had resulted in unsafe ponding and wildlife attraction conditions, and the area was accessible for maintenance only during the dry season." Hartsfield-Jackson Atlanta International Airport (ATL) recently completed two massive projects to relight and remark its airfield. Almost all of the work occurred simultaneously, from March 2014 to July 2015. Together, the improvements cost the airport about $34 million - with no outside funding. Memphis International (MEM) is embarking on an ambitious, multi-faceted plan to right-size its passenger terminal for a better fit with present and future traffic. The current priority, however, is airside enhancements.